Have You Tried: Making Sushi? I recently took a raw food “cooking” class (or raw food construction class) at Raw Gourmets International in Chicago. We spent the whole day pureeing, chopping, and dicing various vegetables and nuts to make ourselves lunch and dinner. In addition to changing the way I use my food processor, I have become emboldened to attempt previously out of reach culinary arts thanks to the class. As such ~ sushi. Whether it be the dexterous challenge involved in using chopsticks, the otherworldliness of seaweed, or the addictive salty dark depths of soysauce ~ sushi is my ultimate night out and one I thought beyond my skill at home. Thanks to the class’s gentle nudge, sushimaki has been rolling off my counter. In the raw food class we learned a version of “tuna salad” to go into the sushi roll. “Tuna salad” involved pureed soaked nuts as the “meat” to which we added minced celery, red onion, parsley, dill, sea salt, and kelp. I have simplified the “tuna salad” into simply pureeing soaked nuts. The rationale behind soaking nuts before you eat them is much the same as soaking seeds before you plant them in the earth. According to my class notes, “the water neutralizes the enzyme inhibitors allowing nuts and seeds to be more easily digested.” Making a raw nut puree is literally just that, soaking the nuts overnight, and then pureeing them into a white mash in the blender. Here is the recipe for this very easy, relatively quick (the quinoa takes 10 minutes to cook), and delicious sushi roll (don’t be deterred if you do not have a bamboo mat, I have made almost 15 rolls without the use of one). 1. Lay one sheet of nori shiny side down, using the back of a teaspoon spread the miso paste on a third of the nori sheet (closest to you). 2. Layer quinoa, nut puree, sprouts, and pickles onto the area with the miso paste. 3. Tucking the edge in as you press down with your fingers, roll the nori sheet away from you tightly. You can seal the edge of the nori roll with a little water. 4. Cut the roll into 8 pieces. 5. Repeat with remaining nori sheets. 6. Serve with tamari or other dipping sauce. This is what I learned from my attempts these past months. • A freshly honed knife is required so that the roll does not collapse under the pressure and spout out the ends. 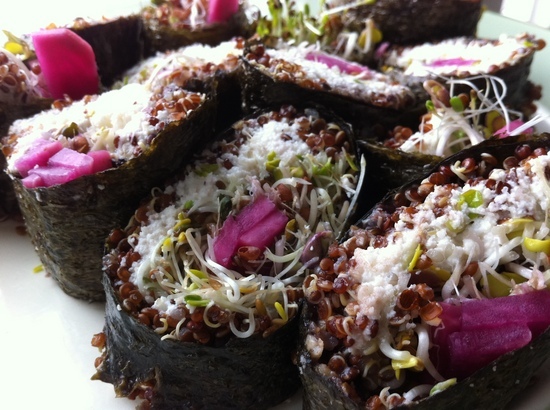 • Make sure the quinoa has absorbed all of the cooking liquid, or it will soften the nori to the point of collapse. • The nori, nuts, pickles, and sprouts are all raw and thus full of digestive enzymes. Quinoa is a great source of protein. This is a great winter treat of color and vibrancy. • Make a few rolls for your own consumption to gain proficiency with the technique before sharing this amazing treat with your friends. This entry was posted in In the Kitchen (recipes & more) and tagged Corinna Borden, Real Time Farms, Sushi. Bookmark the permalink. 2 Responses to Have You Tried: Making Sushi?